“I feel sure that this splendidly written little book will prove to be of immense interest, not only to the people of the North-East coast of England, but to the many others all over the world who are interested in ships. The Industry’s wonderful efforts during the two Wars are clearly demonstrated, as is the terrible depression in the early nineteen-thirties and the brilliant recovery that has been made. We shouldn’t get too hung up on these once great, lost industries. They were hugely important to our story and made Sunderland a prominent place on the world stage, but they are not coming back. So we must look forward. We are looking forward. Sunderland has so much to offer and our rich cultural heritage is an asset to be celebrated and remembered, not a bitter reminder of when times were better. 1346 First recorded mention of shipbuilding at Sunderland. 1672 The Goodchilds began shipbuilding and continued in the business for 149 years. 1768 The Nicholsons, of Panns, started building. 1790 Nineteen ships built on the Wear. 1792 Launch of the Themis, 574 tons. 1793 Sir James Laing and Sons established. 1798 March 2nd. Launch of the Lord Duncan. 1799 Ship built on Bishopwearmouth Green. 1807 John Crown and Sons founded. 1823 William Pile, Sunderland shipbuilding genius, born. Died 1873. 1826 S.P. Austin & Son established. 1835 Sir R.A. Bartram born. Died 1925. 1837 Bartram and Sons founded. 1838 William Pickersgill and Sons founded. 1840 William Doxford and Sons founded. 1845 First Sunderland-built steamer launched, Experiment, 296 tons. 1846 Joseph L. Thompson and Sons established. 1850 Short Bros., Ltd., founded. 1852 February 27th. First iron ship, Loftus, 77 tons, built on the Wear. 1853 Wear Shipbuilders’ Association formed. 1854 Robert Thompson commenced at Southwick. 1865 North-Eastern Marine Engineering Works opened. 1878 Doxfords’ engine works opened. 1880 Last wood ship, Coppename, launched by Pickersgills. 1881 Scotia Engine Works opened. 1893 Last Wear-built sailing ship, Margarita, launched by Pickersgills. 1895 MacColl and Pollocks’ engine works opened. 1903 Austins’ pontoon dock opened. 1904 Overhead gantry built over Doxfords west yard berths. 1912 Swan, Hunter and Wigham Richardsons’ Southwick yard opened. Closed 1933. 1918 well as many naval craft for service in the Great War. 1917 June 15th. King George V and Queen Mary visited Sunderland shipyards. 1918 Grays’ Egis shipyard opened. Dismantled in 1938. 1918 Wear Concrete yard opened at Southwick. Closed 1919. 1920 December 1st. Start of shipyard joiners’ strike, which ended on August 22nd, 1921. 1921 Doxfords’ engined their first ship, Yngaren, with their opposed piston type of oil engine. 1921 Custom of working by the day changed to one of working by the hour. 1923 Boilermarkers’ lockout lasted 29 weeks, April to November. 1925 Greenwells’ dry dock opened. 1930 National Shipbuilders’ Security, Ltd., formed to eliminate redundant building capacity. Four Wear yards closed in consequence – Swan Hunters, Robert Thompsons, Osbourne, Grahams and Grays’ Egis yard. 1935 Government introduced Scrap and Build Scheme to aid ship owners and shipbuilders. 1938 Week’s Summer Holiday with pay introduced for shipyard workers. 1939 March. Government introduced subsidy for British merchant shipping and shipbuilding. 1945 produced a million and a half tons of merchant shipping, or 27 percent of total output for British shipyards, in five years. 1941 Visit of the King and Queen. 1942 Visit of Duke of Kent. 1943 April. Visit of the King and Queen. 1943 June. Visit of the Princess Royal. 1943 Shipbuilding Corporation yard opened at Southwick. 1946 April 30th. Visit of Princess Elizabeth, who launched British Princess tanker at Laing’s. Following my visit to the Roker Pier and Lighthouse I was really interested to find out some of the history of this structure. I’ve been very lucky to get some superb images to share which help to tell the story. It’s such a well-known and much loved landmark. Along with Penshaw Monument, the Wear Bridges and the Stadium of Light it is one of those structures that you just associate with Sunderland. From a distance it looks picturesque and elegant, the red and white tower precariously perched at the end of a sinew of red granite. But then, as you walk out along the North Pier you start to take in the magnitude of this feat of Victorian engineering. You notice the weather worn, rusted iron railings and the masonry worn smooth by the pounding of the sea. This is a structure that has taken a beating. Indeed, it’s very purpose was to absorb those powerful waves and protect the mouth of the wear and allow a safe haven for the ships which allowed trade and commerce to flourish. The story of the Roker Pier and Lighthouse is much more than a story of Victorian ingenuity to tame the sea. It’s the story of why such a structure was required and why so much effort and expense was justified, which is kind of the story of Sunderland itself. First we need to take all this in context. Why was it considered necessary to invest so much to protect the mouth of the River Wear? Sir John Rennie, May 11, 1847. Sunderland was indeed a thriving port in the mid nineteenth century and had been for some considerable time. In 1384 King Richard II granted permission to the inhabitants of the county of Durham, to export the produce of their mines, without the payment of duty to the Corporation of Newcastle. As Sunderland was the main port for the County of Durham this freedom allowed for the development of commerce at the mouth of the Wear. Progress was initially slow until the reigns of Elizabeth I and later James I. A real change came during the Civil War when, during the Siege of Newcastle in 1644, no coal was allowed to be exported from the Tyne and exports from Sunderland began to boom. Efforts were made to rebalance the trade after the Civil War but Sunderland was on its way to becoming one of the most important ports in the British Isles. The increasing importance of Sunderland, as a place of trade, was viewed with extreme jealousy by the Corporation of Newcastle. In 1706, when a proposal was submitted to Parliament, for the improvement of the River Wear, it was opposed by the Master and Brethren of the Trinity House in Newcastle. When a Bill for these purposes was introduced in 1716, the mayor, aldermen and common-council of Newcastle petitioned against it. Despite this an Act was obtained in 1717. It appointed Commissioners for twenty-one years, who were charged with the conservancy of the harbour and they were empowered to raise money, by a tonnage duty on ships entering the port, for the purpose of making the river navigable to Newbridge and building a pier at its mouth. At that time the mouth of the Wear was completely unprotected and must have been a hazardous route to navigate. A pair of beacons were the only marks of guidance for vessels entering and departing from the port. The risk to shipping, the life-blood of commerce and prosperity needed to be protected. Construction of a pier on the south bank at the mouth of the river commenced in 1723 and was completed by 1726. “the goodness both of the River and harbour was greatly impaired by many injurious circumstances. He proposed a number of remedies and improvements, including dredging and deepening of the various channels at the mouth of the river and the construction of a pier on the northern bank. Work on the northern pier began in 1786 and completed ten years later in 1796. The pier was extended in 1803 and an octagonal stone lighthouse was erected at the end to replace the old reflector light. The new lighthouse, Sunderland’s first, was 78ft high with 9 gas burners and reflectors and was visible 12 miles out to sea. The lighthouse was later moved, in 1841 when the pier was extended (a huge undertaking which I wrote a blog on previously). It was replaced in 1856 with a cast iron lighthouse which remained in position until 1983 when it was moved to its present location on the cliff tops above Roker beach. Improvements were made throughout the rest of the 18th century and most of the 19th century as trade and ship building boomed. Docks, locks and ship building yards sprang up on both sides of the river. The Hudson South and Hendon Docks covered an area over 3 miles long. By the late 19th century Sunderland had taken its place as the largest ship building town in the world supporting a host of secondary industries and serviced by a numerous and skilled labour force. By this time, at almost 100 years old, the original two piers at the mouth of the river were proving inadequate to protect the docks and shipping. An ambitious plan was hatched to construct two much larger piers (the North Pier is 2,000 feet or 610m long! ), projecting out to create a 125-acre area of protected water for ships entering and exiting the river. On 27th June 1883, an Act of Parliament was passed sanctioning the construction of the new North Pier, known later as Roker Pier. 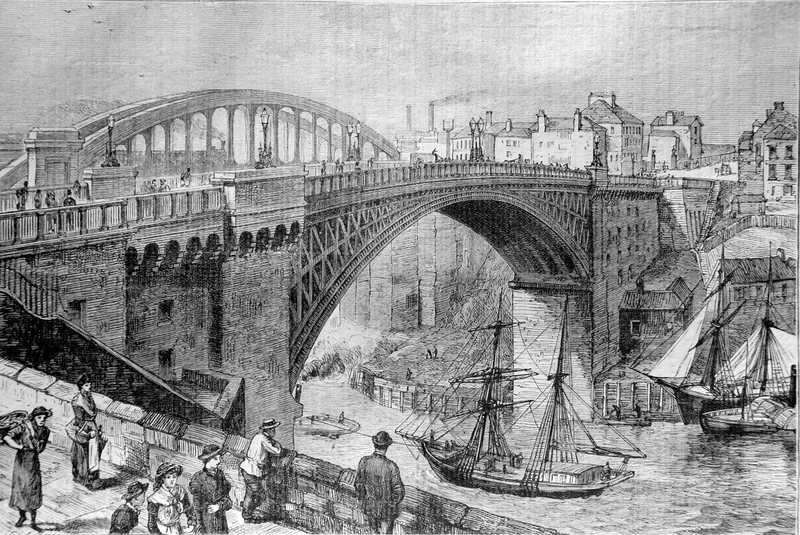 Construction of the new pier was the brainchild of Henry Hay Wake, Chief Engineer of the River Wear Commission. He was born in Sunderland on 2nd January 1844, and in 1860 entered, as a pupil, the service of Mr. Thomas Meik who was at that time engineer to the River Wear Commissioners. In 1868, at the comparatively early age of twenty-five, he was appointed engineer to the said Commissioners upon the retirement of Mr. Meik, and he therefore remained practically the whole of his lifetime in the service of the River Wear Commission. On 14th September 1885, the foundation stone of the new North Pier was laid by Sir James Laing, Chairman of the River Wear Commission. The pier took 18 years to complete at a cost of £290,000. It was an incredible feat of engineering. Construction began with the removal of sand above the bedrock at a depth of approximately 60 – 120 feet. Once the sand was removed, bags of concrete were lowered into place. Each bag weighed 56 – 116 tons and was dropped dry to solidify in the salt water. Upon this foundation the pier was constructed of granite blocks surrounded by concrete. The blocks were lifted into place by a huge “Goliath” gantry crane which trundled along purpose build tracks which can still be seen on the surface of the pier today. When first built, the crane was the largest in the world and dominated the Roker seafront for 18 years. Space was left in the centre of the pier for a tunnel, which ran the full length of the pier to the basement of the lighthouse. This was initially constructed to carry the gas and water pipes for the crane and was later used by the lighthouse keepers to reach the Lighthouse in bad weather. Glass skylights were added at 60ft intervals which can been seen when walking along the pier. Once the main arm of the pier was complete, work began on the construction of the roundhead for the lighthouse. Henry Wake laid the final stone, embedded in the lighthouse parapet walkway, on 14th July 1903. The Roker Lighthouse was built of alternating red and grey Aberdeen granite. The lighthouse has never been painted and the colouring is natural. It has weathered and dulled over time but must have been vibrant when first constructed. The Grade II listed structure stands 82 feet tall and is equipped with a fog horn and lantern, which is visible some 26 miles out to sea. The Pier and Lighthouse was heralded as an engineering masterpiece and garnered national attention drawing crowds of people when it was completed. Work on the south pier began in 1893 and, after construction was disrupted during the First World War, was completed in 1922. It was shortened so as not to restrict access to the river and is smaller than the north pier. The sister lighthouse, which was intended for the New South Pier, was never constructed with a column and fixed light being used. Roker Pier and Lighthouse have stood guard over the mouth of the River Wear for the last 103 years. They’ve bore witness to many changes over that time. As well as performing it core functions of protecting shipping it has been a tourist attraction and was even used to mount a torpedo battery during World War Two. The concrete casemates are still present to be seen at the end of the pier. It’s fantastic that Sunderland City Council has invested in the restoration of this magnificent structure, which will allow it to be experienced as never before! I’d like to thank the following sources for the information and images used in this blog. Whilst taking a gentle stroll along Roker Pier last week I was lucky enough to bump into Matt Storey, the Roker Pier Restoration Project Co-Ordinator. I had met Matt at the first What Next Sunderland Meeting and we had got talking about the restoration of the Lighthouse and tunnel which runs the length of the pier. Over the past three years Roker Pier and Lighthouse has undergone an extensive restoration program, with the council investing over £1.35m to conserve the lantern house and repair the pier deck. The most recent works have been jointly funded by the council and Heritage Lottery Fund and included the restoration of the lighthouse interior, repair of the tunnel floor and drains, and the improvement of access. The final phase of this work to build a new entrance structure is due to commence later this year, with a view to then opening the structure to the public for the first time in the pier’s one hundred and twelve year history. While this work is ongoing the council will be supporting the recently formed Roker Heritage Group to operate tunnel and lighthouse tours, ensuring that when the structure is opened it becomes a popular attraction that can engage people with Sunderland’s rich maritime heritage. So, after bumping into Matt, he very kindly offered to give me a sneaky tour of the Lighthouse! I was just a little bit excited! What an amazing opportunity to have a look around one of the best known and loved Sunderland landmarks! It’s an amazing structure and the restoration works are looking fantastic so I thought (with Matts permission) I would share some of the photos from my visit. I intend to write a further blog, which I am currently researching, covering the history of the Pier and Lighthouse following. In the mean time you might like to take a look at a previous post from back in October which told the story of the moving of the lighthouse on the Southern Pier (https://northeastlore.wordpress.com/2015/10/10/vol-1-no-6-august-1887-sunderland-lighthouse/), so stay tuned! Bottom: View of the South Pier from the second floor window showing the restored brass fixings. Top Left: The basement which is accessed from the tunnel which runs the length of the pier. It contains the large air compressor for the original fog horn. This has now been replaced by a small orange box, a sign that whilst technology has moved on the requirement to warn shipping is the same as it was when the Lighthouse was constructed! Top Right: When you gotta go, you gotta go! Bottom: View up the stairs from the basement to the ground floor. Left: Access to the central shaft which held the winding gear for the original lantern. Middle: Central shaft and stairs on the second floor. Right: Stair case with restored railing (the original fixings were stolen and needed to be replaced). Top Left: A view along the North Pier from the first floor window. Top Right: One of the original vents to help air circulate through the Lighthouse. The Cau’d Lad o’ Hilton will do no more good! The Cau’d Lad o’ Hylton will do no more good! The genuine brownie is supposed to be an unembodied spirit, that has never borne the human form; but the Cau’d Lad has, through the common process of myth-development, been identified with the apparition of an unfortunate domestic who was slain by one of the barons of Hylton in a moment of passion or intemperance. This baron, having ordered his horse to be ready on a particular occasion, and it not being brought out in time to soothe his ruffled impatience, proceeded to the stable, where he found the boy fast asleep and the horse unsaddled. Seizing a hay-fork, he struck the lad a blow which proved mortal. Horrified at what he had done, he Covered the body with straw till night, and then threw it into a pond, where, many years afterwards, in the last baron’s time, the skeleton of a boy was discovered, which was held to be a confirmation of the tale. This pond was afterwards drained, and a cottage was built on the site. Perhaps this story, which was communicated to Robert Surtees, the compiler of the “History of Durham,” by Mr. J. B. Taylor, may have had its origin in the fact recorded of a coroner’s inquest having been held, on the 3rd July, 1609, on the body of Roger Skelton, who was killed with the point of a scythe, accidentally, by Robert Hylton, of Hylton, for which that gentleman obtained a free pardon on the 6th of September following. Lay with the dust proud Hylton’s walls. Strip the lands from Hylton’s lord, etc., etc. If we are to believe Surtees’s informant, however, the Cau’d Lad held full possession of the house several years after the death of the last Baron Hylton, and was not finally exorcised until the beginning of this century by the hospitality of the late Mr. Simon Temple, a wealthy coalowner, from whom Templetown, at the high end of South Shields, takes its name, who for some years occupied the castle, which, but for his interposition, would have been demolished, it having been condemned to be taken down for the sake of the materials. If the ballad – writer speaks truth, the Cau’d Lad did not confine his pranks wholly to the castle. He tells us in a note that the goblin sometimes took a fancy to row people across the Wear at night, in the ferry boat stationed near. He would take them over half way, and then of a sudden disappear, leaving the passengers, though they might be women and children, to shift for themselves; then, after some time, he would make his reappearance, and after rowing them up and down the river a mile or two, would land them on the same side they started from, always making them, however, pay their fare, though what he could do with the money no man could tell. In pursuing this sort of mischievous amusement, the Cau’d Lad seems to have displayed rather the characteristics of the Scottish kelpie than the brownie, only that he does not seem ever to have gone the length of drowning the passengers he deceived, as the kelpie would at least have tried to do. Another freak of his was to sit astride a beer barrel in the cellar to guard the precious liquor. When John, the butler, went down to tap a cask, he often averred that he had found him there. But this latter circumstance is probably borrowed from similar tales told of the familiar spirits in various parts of Scotland and Ireland. Another supernatural visitant is reported to have appeared in the castle shortly before the death of the last baron. When that dignitary was one night entertaining a large company, a greyhound, which nobody had previously seen, rushed into the dining-room, and, neglecting those present, fawned upon the baron, who saw round its neck a collar of gold, inscribed with magical characters, which he alone could read, and which were found to purport that his father, who had been dead twenty-five years, had sent the dog to him to announce his approaching death, and also the speedy downfall of the Hylton family, after a series of twenty descents, stretching through five centuries. The dog disappeared before morning as unaccountably as it came; but the event soon proved the truth of the dismal warning. Where, where will the carrier of Odin alight? He flutters round her bower. To court the maiden’s hand. The raven is lodged in Edith’s breast. O’er planet and sigillary hour! Freya, and Woden, and Balder, and Thor. The story is pretty, and may have led the last baron of Hylton to adopt the raven as his badge, and with gigantic representations in wood of Odin’s messenger to mantle the east and west doors of his mansion. In history, however, we first meet with the Hyltons in the year 1157, when Romanus, “the Knight of Heltun,” agreed with the prior and convent of St. Cuthbert, at Durham, that he and his heirs might have a priest appointed to his chapel at Hylton. The ruined chapel, a few yards north of the castle, can scarcely have any portion which is older than the present castle itself, of the date and builder whereof I shall speak presently, unless it be a few courses of masonry in the east wall of the chancel, which have certainly a Norman look about them, and may well be believed to have been raised at the will of that ancient knight, Romanus. One William de Hylton, almost certainly the grandson of Romanus, about 1198 married one Beneta, daughter and heiress of Germanus Tison, the great-grandson of Gilbert Tison, who is described as the great standard-bearer to William the Conqueror. William’s son and heir, Alexander, was one of a number of English nobles, who in 1241, “took leave of their friends, and, commending themselves to the prayers of religious men, set out in great pomp on their way towards Jerusalem.” From this expedition, there is every reason to believe, Alexander de Hylton never returned. In 1264, Robert de Hylton was one of the knights of the county of Durham who were present at the battle of Lewes. He took part with the barons against the king, and with the rest of the insurgents forfeited his estates. They were all, however, permitted to redeem their confiscated property. His son, also Robert, was summoned to the Parliaments of 1295, 1296, and 1297. In the account rolls of the masters of the cell of Monkwearmouth we have frequent notices of gifts bequeathed to that church as “mortuaries” by the barons of Hylton. The mortuary banner, standard, and coat armour of Baron William Hylton, who died in 1505 or 1506, were removed a few years later from Wearmouth to grace the walls of the Cathedral of Durham. Here they remained until July, 1513, when they were lent by the prior to the then baron, another William, who, in the following October, fought in his sire’s armour, and beneath his sire’s banner, on the field of Flodden. This latter William’s son, Sir Thomas Hylton, joined in the famed Pilgrimage of Grace in 1536. In the reign of Philip and Mary he was Governor of Tynemouth Castle. In 1558, a complaint was made against him that he had illegally detained a vessel from Flanders laden with salt, and that he was in the habit of taking such wares out of ships passing Tynemouth on their way to Newcastle as he was wishful to possess or dispose of to his own advantage. Sir Thomas Hylton died in 1561, and was succeeded in the Hylton estates by his brother William. Sir Thomas had patronised a certain Dr. Bulleyn, an eminent physician of that day. Whilst Bulleyn was in London, Sir Thomas died, and his brother accused the doctor of having poisoned him. Bulleyn was arraigned before the Duke of Norfolk, but was honourably acquitted. The misanthrope of the family, however, was one Henry Hylton, who died in 1641. By his will he left the whole of his paternal estate for ninety-nine years to the Lord Mayor and four senior aldermen of London, in trust, that they should pay thereout £24 per annum to each of 38 parishes, £28 a year to the Mayor of Durham, £50 a year to the Vicar of Monkwearmouth, an annuity of £100 to his brother Robert Hylton, and £50 a year to his brother John. The residue he leaves to the city of London, charging them to bind yearly five children of his own kindred to some honest trade. They were to raise £4,000 out of Hylton rents, the interest whereof was to be employed in apprenticing orphans born in the manors of Ford, Biddick, and Barmston. After 99 years, his estates and the first-mentioned £4,000 were to go to his heir-at-law, “provided he be not such a one as shall claim to be the issue of the testator’s own body.” There were legacies to his servants and to the family of Shelley of Michell Grove, in Sussex. He then appoints Lady Jane Shelley his executrix, and desires to be buried in St. Paul’s Cathedral, “under a fair tomb, like the tomb of Dr. Dunn,” to erect which he leaves £1,000. For thirty years before his death he had been separated from his wife, and a scarce tract of the period states that the charitable bequests of his will were made in order “to merit pardon for thirty years’ vicious life led with the Lady Shelley.” It is needless to say that Hylton’s paramour never raised the tomb for which his morbid vanity craved. Thus encumbered, the estates of the Hyltons, during three generations, only enabled their owners to maintain the dignity of unostentatious country gentlemen. During this period the greatest prudence was manifested in the management of the various properties, with the result that in 1739 the estate and its possessors emerged from the difficulties under which they had struggled for a century. But the last Hylton, a bachelor, was then the owner, and he by will left the home of his ancestors and all other of his possessions, to his sister’s son, Sir Richard Musgrave, on the condition of his taking the Hylton name. The last baron died in 1746, and was buried in the chapel at Hylton. In 1750 Sir Richard Musgrave obtained an Act of Parliament enabling him to sell the estates by auction. These estates covered 5,600 acres, and the annual rental was estimated at a little over £3,000. The Hyltons, it is said, owned almost all the land which could be seen from the battlements of their own castle. It only now remains to describe the castle and the ruined chapel. The architectural features of the former indicate that its erection took place shortly before the middle of the fifteenth century. It is described in 1447 date as “the gatehouse,” though there is evidence to show that the rest of the castle buildings stood north and south of a courtyard before its grand west front. Hylton castle is noted for its heraldry. Besides the royal arms of England as borne from the reign of Henry V. to that of Elizabeth, we have on the west front the banner of the Hyltons beneath a ledge of canopied work, and the shields of the many noble families with which the Hyltons were allied. On the east front is a fine sculptured roebuck, at one time the Hylton badge. Beneath is the Hylton shield under a helmet, over which is the later Hylton crest, a head of Moses in profile, horned with triple rays. Of the origin or meaning of this extraordinary heraldic bearing I can offer no suggestion. The west front is surmounted by four octagonal turrets with machicolations on every side. There is a round turret at each end of the east front. The central oblong tower of the east front rises a story higher than the rest of the building, and has a floor on the level of the leads, which we may conveniently call the guard room. Each turret has independent access from the roof. The octagonal turrets are even provided for defence against an enemy who might have climed to the battlements. The portion of the chapel which remains is only the chancel of the original structure, and was probably built by Sir William Hylton, who died in 1457. Its two transepts are additions of Tudor date. Each is of two stories, though the dividing floors are gone. The upper stories were reached through doorways in the east wall, now closed with masonry. The western extremity now is the ancient chancel arch, walled up in the last baron’s days, with a doorway altogether of his time beneath, and portions of what was probably the nave’s western window clumsily utilized above. Within the walls of this now ruined and abandoned though episcopally consecrated edifice, the mortal part of many of the barons of Hylton, their wives and their children, found rest. Their retainers were consigned to the graveyard outside. The chancel vault is now broken open, and the bones of the Hyltons have been scattered, no one caring whither. A thigh bone, said to have been that of the last baron, is preserved in the castle, (now the property and residence of Colonel Briggs), and the whereabouts of some other osseous reliques is known. Andrew White, of Frederick Lodge, Sunderland, and Tunstall Lodge, county Durham, first and three times Mayor of Sunderland, Member of Parliament, Borough and County Justice, and a Deputy-Lieutenant for the county of Durham, was born in Sunderland in the year 1788. He was a son of John White, of Thorny Close, Durham, the most extensive shipowner in Sunderland at that time, a colliery owner, and the proprietor of the Bishopwearmouth Iron Works a gentleman of large means and philanthropic spirit, who built at his own cost the Wesleyan Schools in Hendon Road. After receiving a sound education (he was a pupil of Rev. John Hayton), Andrew White early entered upon a business and public career. Together with his brother Richard, he was taken into partnership by his father, and the firm became John White and Sons. Endowed with more than average ability, and the happy possessor of a genial and polished manner, he was not long in making his influence felt in the good town of Sunderland. When in 1835 an agitation arose for taking advantage of the Municipal Reform Act, he was the chosen champion of the Municipal party. Although Bishop Morton had in 1634 vested the government of the town in a “Mayor, twelve Aldermen, and Commonalty” all duly elected and acknowledged by the State the charter had fallen into disuse, and a strong faction now objected to the formation of a council without a special Act of Parliament. Mr. White, however, presided at a meeting on the 16th December, 1835, and, strengthened by the opinion of the then Attorney-General, the meeting unanimously resolved to take advantage of the Act. An opposition meeting was held on the 17th, when Mr. R. Pemberton, Mr. Fenwick, and Mr. Featherstonehaugh, together with some of their friends, strongly opposed the resolution adopted at the previous meeting. Their objections were, however, overruled, and on December 26, 1835, the first election of councillors for the newly-constituted borough of Sunderland took place. The subject of our sketch was returned at the head of the poll for two wards the Bishopwearmouth and the West Wards his brother Richard being returned for the Ward of St. Michael, also at the head of the poll. The first meeting of the Council was held on December 31st, and at a subsequent meeting on New Year’s Day, 1836, Mr. Andrew White was chosen first Mayor, and Mr. Ritson Town Clerk. On this occasion the ladies of Sunderland presented the Mayor with an elaborate silken banner on which was emblazoned in letters of gold the statement that he was “the pride of his native borough.” This banner, at a later date, Mr. White presented to the Corporation, and it now occupies a conspicuous position in the New Municipal Buildings. The chief magistracy, however, was not to be an enviable position, for on the first occasion that Mr. White took his seat at the head of the Bench he was hustled, and a demonstration was made, more against the office than the occupier of it. The county magistrates declined to recognise the Mayor’s authority, and the battle waged long and furiously; but Mr, White held his court at a different hour to the opposition until he was left in undisputed possession of the field. He was re-elected Mayor on the 9th Nov. 1836, but retired in July, 1837, to fill the more important position of Member of Parliament for the borough. The new member sat in the Whig interest, his colleague being Mr. Thompson, a Conservative. As showing the contrast between past and present elections, it may be mentioned that Mr. White’s election expenses on that occasion amounted to £16,000! From this time new honours came thick and fast. Mr. White was made a deputy-lieutenant of his county, was present at the coronation and marriage of his Sovereign, and presented her with a congratulatory address from the borough of Sunderland on the occasion of the birth of the Princess Royal. For many years he held a prominent position in the county, taking a leading part in all philanthropic movements. It was an annual custom of his at Christmas time to entertain to dinner in his town house, Frederick Lodge, the whole of the chimney sweeps of Sunderland a portion of the community at that time in anything but affluent circumstances. Severe losses in winning coal came upon him in the closing years of his life, and he retired from all public work. Mr. White, who died in 1856, had no offspring, and the only male representative of his family in the North of England is Mr. John White, of Claremont Terrace, Newcastle, who is the only son of Andrew’s brother and partner, Mr. Richard White (Mayor of Sunderland in 1840). Some younger brothers went to reside in the South of England early in life, and many of their progeny now occupy exalted positions in the Church and Army. Our portrait is taken from an engraving of Bewick’s painting of Mr. White whilst Member for Sunderland, now in the possession of his great-nephew, Mr. J. Holmes White, of Newcastle.